Discover exceptional care by our dentists in Apizaco. Located in the center of Tlaxcala, Central Mexico, Apizaco is a young city in this enchanting state where you can get away from it all and experience the real Mexico. 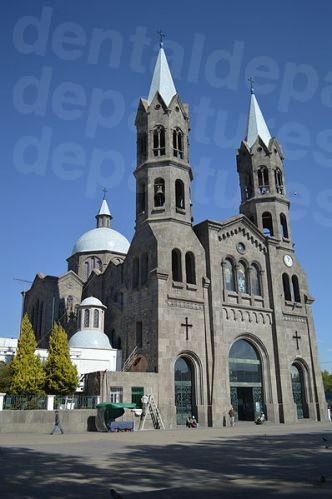 Apizaco is Tlaxcala’s second biggest city, after the state capital – the city of Tlaxcala – and is important from a commercial perspective as it is positioned halfway on the road between the port of Veracruz and Mexico City. Evolving in the mid-nineteenth century as a result of the railroad construction, its peaceful streets belying the frenetic commercial activity that takes place here. While Apizaco is a relaxing place and does have attractions of its own, the rest of the state of Tlaxcala has a varied countryside, is big on history, both Colonial and pre-Hispanic, and has a laidback disposition that invites you to explore and find the real Mexico. Apizaco’s location in the center of the state makes a good base to be able to do just that. Back in town, one of the most visited attractions in Apizaco is Our Lady of the Misericordia Basilica. Basilicas are usually important, large churches with certain privileges conferred upon them by the Pope. As such, they are Catholic pilgrimage sites, and receive millions of visitors each year. Other notable buildings of worship worth visiting in Apizaco include the El Calvario Chapel, the Santa Anita Temple and the Santa Maria Monastery Church and old convent. There are many cattle ranches in the area, reflected by Apizaco’s bullfighting traditions with its well-known bullring and the frequent running of the bulls festivities. Like the rest of Mexico, the people of Apizaco do like a festival. Catch the newly established (2011) International Cervantino Festival taking place in October, which features performances from traditional Mexican dance to European electronic music performed by international artists. For a peaceful, relaxing Mexican town, Apizaco is high on the list, offering dental patients all the everyday facilities and conveniences you may need. However, you can choose whether to be part of the action, or blend into the background, depending on how the mood takes you. 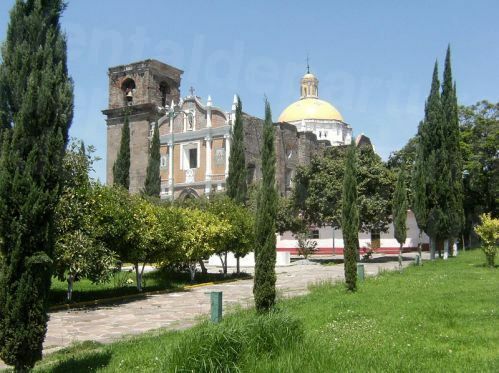 Apizaco is in the center of the state of Tlaxcala – about half an hour’s drive from the city of Tlaxcala. Why visit a dentist in Apizaco? Apizaco’s central location makes it easy to visit many of the attractions that makes Tlaxcala such a fascinating destination. The state is only small, but it packs a lot of history with ancient ruins, colonial architecture and old haciendas that give visitors a real taste of old Mexico. Unlike some of Mexico’s other famous attractions, you may find you have them all to yourself. In the surrounding countryside activities range from the sedate to the high adrenalin, which gives you a lot of options depending on how you are feeling after your dental care. Accommodation in Apizaco suits all budgets and styles from 3* to 5*. Outside of the town there are converted haciendas and ecotourism options for getting back to nature. Yes. There are no US government travel advisory warnings for Apizaco, or for the whole state, so you are safe to visit any of our dentists in Tlaxcala. You would be forgiven for thinking that the low prices in Mexico for dental care is a reflection of the quality. However, in our experience it is far from the truth, especially these days. Globalization means that modern dentistry is now accessible throughout the world, and countries that may have had a dubious reputation for quality in the past are now competing to provide excellent quality services but at much more affordable prices. The main reason that prices are lower in destinations like Mexico is because the cost of living, i.e. overheads such as staff wages, office rent, equipment etc. is so much less here and not because they use inferior materials or technology. We’re not saying all dentists in Mexico are great – there are good and bad everywhere, even in your home country, but that, generally, dentists in Mexico who treat overseas patients tend to provide treatments equivalent to what you’d expect at home. Essentially, you have to do your research in order to find the most reliable dentist for your needs, and this is why booking with Dental Departures helps. Our partner clinics in Mexico have already been pre-screened using a four-step process which includes a site visit; quality survey; online reputation and dental license verification. All you have to do is look through our website, and decide where you want to go. Secondly, all our dentists offer warranties or guarantees on their work – including the work they carry out, as well as the materials used. If a problem arises under warranty then you are assured that the dental work will be fixed free-of-charge. Of course, you may be worried about incurring additional travel and accommodation costs in the unlikely event that you do have to go back. So, we have got together with some insurance companies who will, for a small cost, cover you for this eventuality. Our dental clinics in Apizaco have English speaking staff, and you will find hotels and major attractions usually have English-speaking staff too. You may need to know a little Spanish as this is, so far, a little known tourist destination to the rest of the world. Please check out the individual clinic listings on our website for confirmation. Our clinics don’t usually accept US or Canadian insurance, but if your insurance provider allows ‘out-of-network’ care then you may be able to claim back your expenses once you have returned home. Ask your insurance company before you travel, making sure you get the appropriate paperwork to bring with you. One thing is for sure, your money will certainly go a lot further in Apizaco. When is the best time to visit one of our dentists in Apizaco? The weather in Apizaco can be described as arid and temperate. In the winter it can get very cold, falling below 0°C, and in the summer climbing above 30°C. However, the average temperatures tend to be in the low to mid twenties. Our dentists are open all year round so any time is a good time to visit. Modern hotels are mainly wheelchair accessible but getting about everywhere else in a wheelchair may be rather hit and miss. Our dentists are usually wheelchair accessible and many provide transport to and from your hotel to your appointments. Let us know your requirements as we can always find a way to get you to one of our dentists. If you require sedation dentistry you should note that the standard method of pain relief is local anesthesia in Mexico. Sedation dentistry is a service offered by most of our dentists, but it has to be booked in advance as an anesthesiologist will need to be in attendance. The service costs an additional $400-$600. If you need anxiety medications such as Valium, these must also be ordered in advance. What else is there in Apizaco? The number 212 steam engine stands as a monument to the Nacozari hero. In the early part of the 20th century a young locomotive driver averted disaster from the small town of Nacozari by driving a dynamite-laden train which had caught fire away from the town. He managed to drive the train 6 km away before it exploded, killing him and 12 other bystanders. The blast was heard up to 16 kms (10 miles) away and shattered glass in the town as well as sending debris and twisted metal kilometers away. If it hadn’t been for Jesus Garcia’s bravery then Nacozari’s fate would have been a lot, lot worse. Further afield from Apizaco you will find plenty of other interesting sights and pursuits. The state capital, Tlaxcala, is believed to have some of the finest examples of colonial architecture in Mexico. Its gardens and squares lined with bars, restaurants, shops and cafes provide ample refreshment opportunities as you meander through its pretty streets. Here, will also find the oldest church in Mexico – the Church of Sa Francisco – built in 1521. There are hundreds of archaeological sites across the state, but Tizatlan, Cacaxtla and Xochitecatl are the most visited. The latter is known as the Pyramid of Flowers and is on the summit of a 4 km wide extinct volcano. 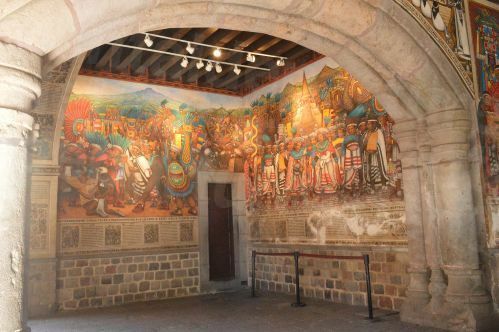 It is only around a kilometer away from the Cacaxtla palace site, which contains Maya-style vibrantly painted murals. Beautiful countryside, old haciendas – some transformed into relaxing retreats and mountain villages like Tlaxco – the scene of bloody battles throughout history but is surrounded by woodland, creeks and small waterfalls is a pretty and peaceful place to spend some time. History abounds in and around Apizaco, but the facilities are first-class. There is an international airport just outside the state capital, which is the nearest, and also Mexico City’s Benito Juarez International, which is around 80 miles away. Find your dentist in Apizaco and book an appointment through Dental Departures online. Alternatively, if you’d like to talk to us phone our toll-free number to speak with one of our knowledgeable Customer Care team or use our online chat facility. We’re here to help you find an affordable, quality-checked dentist practically 24 hours a day.